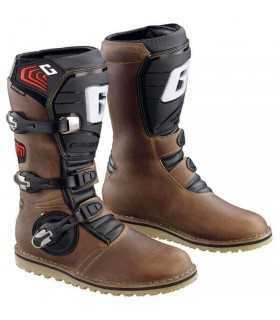 GAERNE TRIAL BOOTS MODEL PRO-TECH. GAERNE TRIAL BOOTS MODEL PRO-TECH. THIS BOOT IS MADE OF LEATHER CONSTRUCTION AND FEATURES A NEW MOLD INJECTION SHIN GUARD AS WELL AS THREE ALLUMINIUM BUCKLES THAT ARE REPLACEABLE. THE SOLE IS GUM RUBBER TO PROVIDE FEEL AND CONTROL.